If you use Google street view to get directions to Jacksonville, Texas, a glance into the sky reveals none other than…a good old fashioned pink UFO. That’s what Andrea Dove recently discovered when she signed on to the popular online address tool to map her way from her home near Houston to visit a relative in Jacksonville. Dove contacted ABC affiliate KLTV in East Texas after she used her computer keyboard controls to manipulate the street view and spotted what looked like a classic flying saucer in the sky. 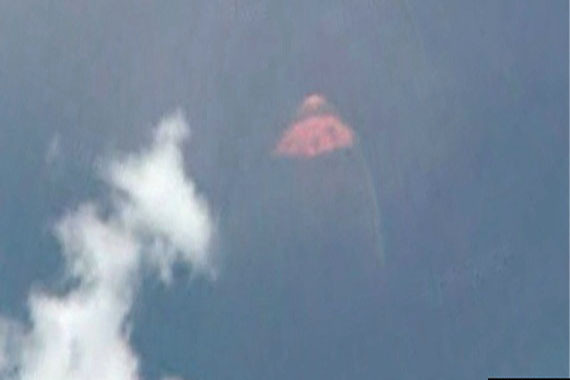 It seems to be circular with a domed top, and, well, it’s reddish-pink. The image also appears to show a thin, white line hanging or trailing from the object. “No one I spoke with had seen anything strange over Jacksonville, and although it could be a lens flare or an unexplainable reflection of some nearby object, I saw no indication of anything which fell under that umbrella,” said KLTV reporter Jamey Boyum. Lens flare? That’s exactly what photo-video analyst Marc Dantonio thinks is going on here. “I examined the Google Earth photo in question. This is a simple, but classic, lens flare,” Dantonio told The Huffington Post in an email. “It is oriented exactly perpendicular to the sun, which is, of course, the source of the lens flare. The red color — although apparently odd — is not really unexpected. Color can be related to chromatic aberration where the light rays do not reach the same focal point, causing the final artifact to appear in a primary color like red, green or blue,” said Dantonio, who creates special effects and prototype models for U.S. government projects. But wait…there’s more. ABC News also reports what appears to be another lens flare “UFO” — seen below — found on a Google street view, but nearly 1,000 miles away in Acoma Pueblo, N.M.
Like the aberration in the Texas image, this New Mexico one is also a reddish-pink color. And, according to ABC, there seems to be one common denominator between the two locations: A McDonald’s. KLTV contacted Google for some comment about the seemingly airborne pink anomaly, but they’ve yet to hear back from them. The original Google street view page where the Texas UFO was found can be seen here. And the original street view page for the New Mexico object is here. Stupid reflections and lens flares.